Randolph received the award at the Graduway Leaders Summit in Boston. From left are Daniel Cohen, founder of Graduway, Kristin Dabney, Randolph’s alumnae and alumni career network manager, Christine Harriger, Randolph’s director of Career Development, and Sevonne Eliyahu, Graduway’s vice president for customer success. RandolphConnect, Randolph’s new web-based networking platform for alumnae, alumni, faculty, staff, students, and parents, received a national award this week for its successful launch and exponential member growth. 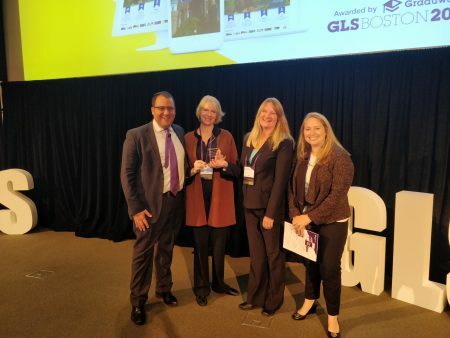 Randolph received the Outstanding Network Launch Award on October 16 at the Graduway Leaders Summit in Boston, which is an annual gathering of leaders with the focus on best practices in alumni relations and career mentoring. More than 300 delegates attended the conference to share best alumni relations practices, develop professionally, and network. Get connected today by visiting www.randolphconnect.com.